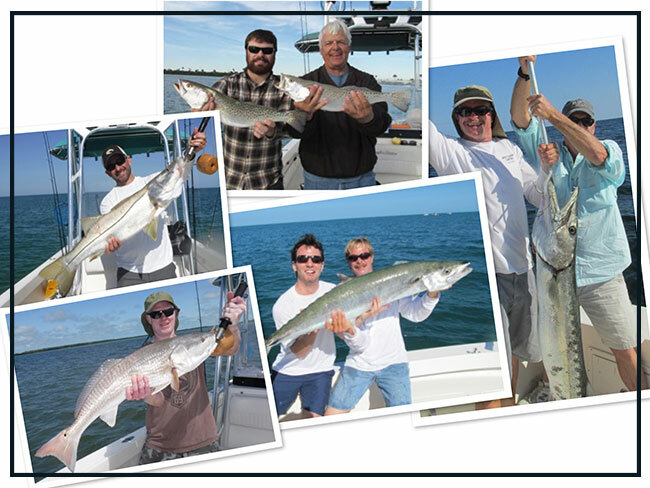 The Tampa, Clearwater, and Tampa Bay areas offer a broad array of Tampa and Clearwater fishing charters. Your Tampa fishing trip begins fishing along our beautiful, world class beaches for game fish like Snook, whose drag screaming runs and jumps will excite even veteran anglers. If redfish are your primary target, you can pursue these tough battlers out on the Tampa Bay fishing flats, or in tight against the mangroves or other shoreline structure. Speckled sea trout represent our most readily available game fish in Tampa, FL. Trout can be caught most times of the year and often, from late November to early April, in great abundance. During the spring and fall months, near shore Clearwater fishing, (2 - 9 miles out) offers the opportunity to catch a wide range of species including Spanish mackerel, mangrove snapper, kingfish, grouper, and others. All of these species can be caught in Tampa and Clearwater using artificial lures or live bait. Gone Fishing Charters prides itself in providing high quality tackle and a well maintained, top of the line, boat. Fishing is a great sport that can be enjoyed by everyone from kids to adults,and anglers of all skill levels. Fishing charters are not limited to season or location, providing a healthy diversion from daily life. Take time to go fishing, relax, and create fishing trip memories that will last a lifetime! Go Tampa Fishing Now ! Call me today to reserve your fishing adventure !! As a friend of mine once said, I feel sorry for anyone who hasn't discovered their passion in life. We all have one inside of us. It's that activity that brings you immense satisfaction. At seven years of age, I was introduced to fishing and knew it would be a part of my life from there forward. Although I fished whenever the opportunity arose, it would be a long time before I would actually become a guide. I went to high school, then college. Next, I held a variety of sales positions that took me to every state in the US. Then, in late 2005, it was time....time to walk away to spend my working hours doing something that I had always really wanted to do...fish. I pulled the plug to pursue my dream...become a fishing guide in the great state of Florida....arguably one of the best states to fish in the entire United States. My intent was to offer the kind of service that I would expect from a top quality, professional, guide. I would cater my trips to the age and skill level of those on my boat to maximize my customer’s enjoyment. Most importantly, I would let my passion and intensity for catching fish show each and every time on the water. My commitment is to provide all of my customers with this type of experience. "I would let my passion and intensity for catching fish show each and every time I was on the water"
You will be fishing in a state of the art, 2005, custom-built, 24 foot Sheaffer boat. 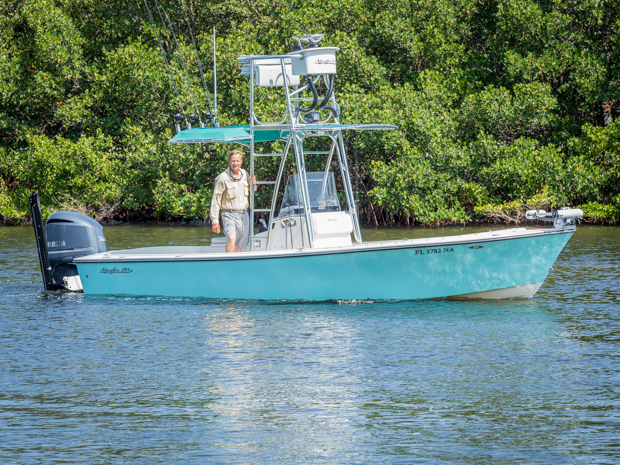 Made locally in Tampa, Florida, this boat is designed specifically to fish the shallow, inshore waters of the Tampa area. 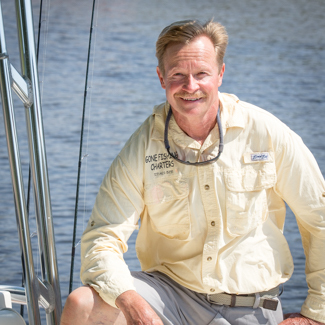 Your fishing guide, Captain Stewart Ames, is US Coast Guard licensed and fully insured and has 25 years of light tackle fishing experience in Northern Pinellas County. It is this experience that guarantees that you’ll be fishing where the fish are at any given time of the year. Your fishing charter includes tackle, bait, fishing license, ice, water, and photos of your fishing experience. Your catch will be cleaned, bagged and iced. Maximum capacity is 6 anglers but parties of 2 - 4 anglers are best. With a second set of controls up in the tower, sight fishing ability is greatly enhanced. The net effect is more time spent fishing where the fish are. The tower also increases the chances at getting a good cast at a roving Cobia, Shark or Tarpon that otherwise might not be seen. During the heat of summer, the tower sun shade can make your fishing experience that much more enjoyable. An additional front sun shade can be attached if requested. The highest quality tackle is provided for your fishing trip to insure that when a fish is hooked, chances are maximized to land it. Line - All rods are spooled with Berkeley Braided line. Leaders - Ande high quality flourocarbon material. Snook, an elusive and prized gamefish! Snook clearly represent the class of the inshore game fish. Their speed, strong runs and occasional jumps make them the fish of choice for many Florida anglers. Snook are available year round; however the cooler, winter water temperatures slow their metabolisms significantly and make them a difficult target during our coldest months. A wide range of artificial and natural baits can be used to catch snook. The most commonly used method is live baiting with scaled sardines or “whitebait”. However, be sure to review all current fishing regulations before keeping any Snook as this species is heavily protected. Spring and fall fishing typically takes place along inshore structure…river mouths, mangrove shorelines and residential docks. Come late spring, fish move out to the beaches, gather in larger groups and can be caught in greater numbers. During the hottest months of summer, fish tends to feed best during low light periods and at night. Redfish are strong and unrelenting when hooked. 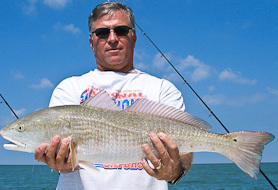 Redfish are an extremely popular target for West Coast Florida inshore fisherman. They are abundant, generally aggressive feeders and, once located, can be caught in significant numbers. Although lacking the speed and jumping ability of the snook, they are most appreciated for their powerful, fighting style. When fishing the flats with artificial baits such as plastic baits or spoons, a redfish provides a jarring strike. Using bait, the take is typically a light tap followed by a driving run. Larger schools of fish can also be located on shallow grass flats. Getting properly positioned in front of a large school of “reds” can quickly put a bend in every rod on the boat. Redfish provide good summer action, even during the hottest months. Although fishing is slower during the winter, groups of fish can be located in the warmer backwater locations. Once located, these schools can provide “rapid fire” action.